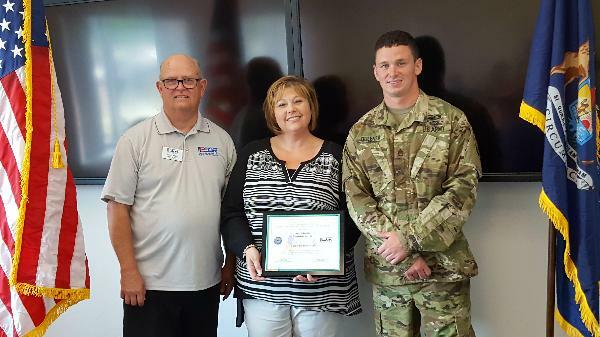 WEST BRANCH, Mich., Aug. 25, 2016 – A Consumers Energy meter reading supervisor has been recognized by the U.S. Defense Department for her willingness to accommodate an employee and National Guard reservist’s military training schedule. Janice Smith, a meter reading supervisor at the company’s West Branch Service Center, was honored by the Employer Support of the Guard and Reserve, a division of the Department of Defense, for going above and beyond to accommodate a short notice training requirement for employee and National Guard Reservist Eric Queener. “We are committed to a talented and diverse workforce, including the addition of military veterans. We seek ways to welcome these dedicated and professional men and women into the Consumers Energy family – and to ensure they have the opportunity to continue to serve our country,” said Cathy Hendrian, Consumers Energy’s vice president of human resources. Queener, a meter reader in West Branch, served nearly four years in U.S. Army active duty as a cavalry scout where he earned his Airborne and Ranger certifications. One of his deployments was to help secure Sadr City, Baghdad in the U.S. troop surge of 2007. He is currently a Staff Sergeant and has been an instructor for the past eight years with the 108th training division out of Fraser. Hired in February 2016 by Consumers Energy, Queener was Smith’s first interview as a new meter reading supervisor. “Eric was very up front about his military status and obligations. As an Air Force veteran I know his first commitment is to defend our country, and felt this was my obligation to him, not his to me,” Smith said. Originally Queener was slated to attend schooling late last year, but that was cancelled. Then he was called to report to annual training in less than 10 days, while still a probationary employee. Typically reservists are asked to provide at least 30 days notice of scheduled military service. Queener said Smith was supportive from the minute he told her of his upcoming schedule. “I’ve heard horror stories about employers who aren’t willing to accommodate, but Janice said ‘Let me know the days and I’ll take care of it.’ I never even heard her sigh,” he said. While performing his annual training, Queener said he talked to fellow reservists who experienced difficulties getting time away from their jobs. He shared his positive story with one of the commanding officers, who told him about the Patriot Award. Queener nominated Smith. While Smith is the actual award recipient, she said the award should be shared with all her employees, some of whom traveled daily from the Midland Service Center to help ensure meters got read during Queener’s two-week absence. Peter Pallas, ombudsman director for Employer Support of the Guard and Reserve, saluted Smith. “Without the cooperation of people like Janice Smith and the promise of meaningful civilian employment, these citizen warriors could not defend and protect us at home and abroad,” he said. The Employer Support of the Guard and Reserve was established in 1972 to promote cooperation and understanding between Reserve service members and their civilian employers and to assist in resolving conflicts arising from an employee’s military commitment. Consumers Energy was recently recognized for its dedication to employing military veterans, being named a silver level Veteran-Friendly Employer by the Michigan Veterans Affairs Agency.